With your help, the EQUAL Health Network brings together partners from public health, women’s health and the public to advocate for Equitable, Quality, Universal, Affordable – EQUAL – health care. Browse this site through the National Health Reform Law button above for research and policy analysis about the Affordable Care Act, and key documents, including links to the full text, summaries, EQUAL presentations, the popular “Myths and Facts” about the U.S. health care system, and Archives on the policy and politics of health reform from 2008 to March, 2010. Implementing the Law highlights proposals to implement the law in the interests of people who use and work in health care, including EQUAL’s campaign on the medical loss ratio. Ways to Improve Health and Health Care include strengthening coverage for reproductive health care, and single payer news.. 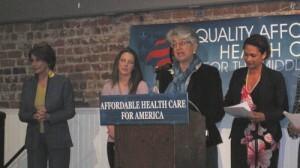 EQUAL Resources presents EQUAL videos and publications on health care reform. About Us includes some current and past publications, such as work on NICUs and NAFTA. Quicklinks, below, goes to the latest news and Events. Our clear presentations and public events arm activists with the facts about health care reform and the policy process. Your support helps us bring timely, accurate news and progressive analysis about health reform to policy-makers and the public, through the EQUAL listserv, blogs, and the web. EQUAL is a project of the Center for Policy Analysis, an independent 501c3 organization working for a healthier world. We rely on you to fund our work. Please support the Center’s unique voice by making a tax-deductible donation online now.